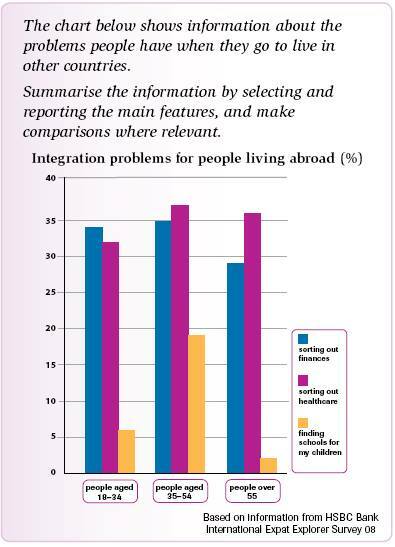 A breakdown of the percentage integration problems for people in different aged who live in overseas is illustrated in the bar chart. At first glance, the most obvious piece of information is that all people in different aged face the same problems. While the highest problem faced by people aged 25-54 is shorting out healthcare, sorting out finances is the main problem experienced by youngsters. Moving to a more detailed analysis, the highest problem faced by group aged 25-54 is sorting out health care, a problem experienced by 37 percent, which is followed by 35% in sorting out finances. However, young group people aged 18-34 face sorting out finances as the most difficult problem, 34% young people get this problem, and around a third (33%) by sorting out healthcare. Turning to the next analysis, the group people aged over 55 find the main trouble by 36% in sorting out and healthcare followed by sorting out finances. Interestingly, the smallest problem faced by all of the groups is finding schools for my children. The chat shows problems faced by people living in foreign countries. It is clear that sorting finances is the main problem to many people who are living in foreign countries. People aged 35-54 years are highly affected with their colleagues aged between 18-34 years slightly less affected. People above 55 years are not as much affected as these young bloods. Sorting out healthcare is also a major problem, with the elderly most affected. People above 35 years are highly affected compared to those aged 18 to 34 years of age. Finding school for children is also a challenge but not severe as sorting out healthcare and finances. People aged over 55 years are the least affected followed by those ranging between 18 years and 34 years. This may because normally people falling on these age groups are not likely to have school going children opposed to those aged between 35-54 years who are majorly affected. that you use in your sentences. Linking verbs may be small words but they help make your sentence mean more sense.